In case of No Show or Cancellation made later than 48 h before check in date we will charge for the first night. We don't refund the deposit. 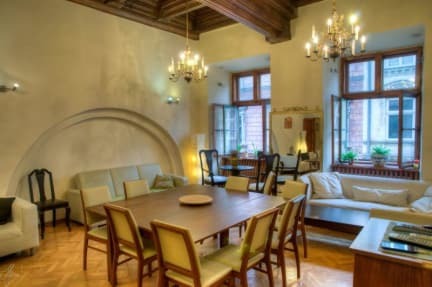 - An unbeatable location: Florianska is Krakow's most famous street. The hostel is a 10 minute walk from the train station, and a 2 minute walk from Krakow's famous Main Market Square! - The layout of the hostel means that the rooms are well separated from the common areas, so any parties will not disturb those wanting a good night's sleep! - The main common room is equipped with a plasma TV, DVD player, surround-sound stereo, and loads of books and dvds. - Our guests can use our fully-equipped kitchen, so you can cook your own food whenever you want. - To ensure a comfortable stay we offer free luggage storage, free lockers and padlocks (that are available for rent for a refundable deposit of 10PLN), and the reception is open 24 hours! - There is free Wi-Fi throughout the hostel. - Our knowledgeable receptionists that will go out of their way to may your stay as enjoyable as possible. Apart from free maps and tourism advise, you can also book Auschwitz and Salt Mine tours, and much more! - we are situated on The Florianska Street- the most famous and busiest street in The Old Town which means that it gets noisy during the day as well as the night- we can't help the noise coming from the street or nearby pubs. - we respect people's right to sleep however we are a hostel which means that most of our guests are young and outgoing people so keep in mind that they can make some noise during night hostel.